Please note this video was created before the new UNIFORM POLICY was released, legal singlet numbers are now 0-99. 0 and 00 are considered different numbers. 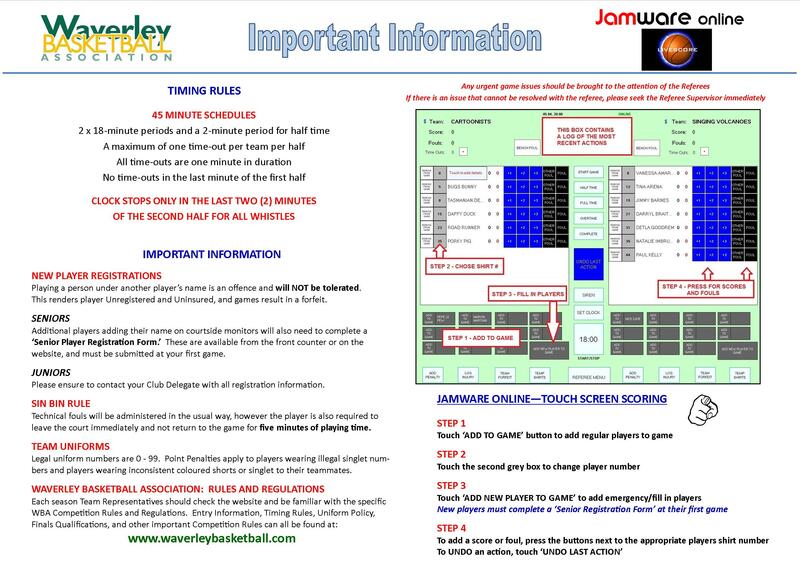 Waverley Basketball Association was the first stadium in Victoria to introduce touchscreen scoring monitors on all courts. After extensive testing on our Sunday Night Mixed competition throughout 2007, the monitors were introduced to all Senior Compeitions in 2007, before being introduced for Junior Competitions the next year. The touchscreen monitors work as digital scoresheets, scores and fouls are recorded throughout the game, before the result and all game information is sent to the central server after being signed off by the referees at the end of the game. Information from the digital scoring system is used to calculate results and ladders, as well as display the live scoring logs on the website and the Jamware Statistics Vault.